COLLINGWOOD, ON, Aug. 10, 2018 /CNW/ - Recent applications for final site plan approval for the next phase of a master planned destination tourist development project in Collingwood have generated interest and questions from neighbouring residential owners. Recent media releases on behalf of some of the residents include key points that are clearly erroneous and therefore misleading to the casual observer and reader. Known as "Living Water Resort and Spa", this major tourist hotel project attracts visitors from far and wide by providing contemporary hotel suites along with first class restaurant, spa, fitness, marina and meeting room facilities. These existing facilities are part of multi-phase master planned development that has its planning and approval processes dating back to 2004 with proposals for hotel type uses. 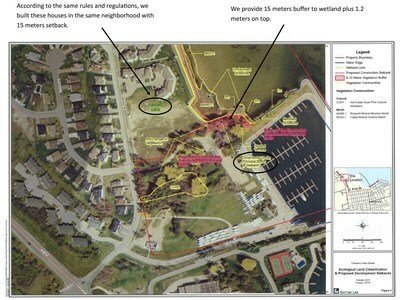 The first site plan agreement was approved by the Town in 2006 after a thorough technical review process. The developer and visionary behind this project is Larry Law. Larry is no stranger to Collingwood having purchased Cranberry Inn and golf course in 1992. Although Collingwood was in the midst of a serious recession at that time, Larry could see the potential of the Town to recover. By investing in improvements and developing new units during the 1990's Larry helped Collingwood send the important "we are open for business" message. In fact, Larry built most of the existing residential neighbourhood that lies immediately north of the Living Waters project. Larry is one of Collingwood's top employers with over 500 people on staff. The various resort, hotel, spas and related facilities also represent a significant contribution to the local property tax base. The proposed expansion will increase these contributions to the local economy. Larry is rightfully proud of his track record of giving back to the community, creating jobs and building a better place. Unfortunately, Larry's proposal to add much needed meeting and conference space has met with confusion and misunderstanding over facts as reflected in recent media releases. This is unfortunate in light of the fact that Larry met with the two adjacent condominium boards and their managers on two occasions in June and July of this year but could not agree to their request to reduce the height of his proposed addition to three storeys. A two fifths reduction in space that is allowed under existing zoning is simply not tenable. As noted above, there are important aspects of the proposal that are being described with incorrect information primarily circulating under the "SOS" banner. For example, the additional meeting and conference floors are to be built over the existing Bear Estate building, the building footprint is not expanding out towards the environmental lands or the related buffer lands. To be clear, the proposal is not to build closer to any setback area which means the existing 1.2m building setback from the established 15m buffer area will be retained. This is not a fact reflected in materials from "SOS". In fact, SOS misleadingly observe that the proposed building will be built 1.2 metres from the wetland border. This is simply not true. With regards to the environmental area, the development lands are in proximity to a wetland associated with the shore of Georgian Bay. The existing 15m buffer setback to the nearby environmental area was established through previous approvals and includes landscape planting. As noted above, this setback and the landscape buffer will be respected under the current proposal. This fact that the 15m buffer is retained is not acknowledged in materials being circulated by SOS. As an aside, this same setback is applied to the existing neighbourhoods to the north as they abut the same ecological features. The 15m setback was approved by the environmental review and approval agency (Nottawasaga Valley Conservation Authority or NVCA) in 2006. That approval was based on plans and an Environmental Impact Study (EIS) prepared to assess the environmental areas and the potential impact of development. The EIS was updated with a notation that habitat for Snapping Turtle does not exist with the proposed development area. This observation by qualified personnel undertaking the EIS was misconstrued by SOS and reported in a way that leads to the incorrect statement by SOS that the EIS concluded such habitat does not exist in the area. To be clear, the EIS noted that such habitat does not exist within the proposed development area. On the environmental matter, the original EIS is over ten years old and is accepted as accurately describing the ecological setting of the proposed development area. Nothing has changed that affects the established ecological setting. The wetland boundary remains the same, the 15m buffer is respected and retained and the proposed development area is not being expanded. The assertion by SOS that the ecological nature of the area is vastly different is simply contrary to the EIS update. These points are clearly made by the authors of the EIS update in a recent follow up Letter (from Hensel) submitted to the Planning Department (see https://livingwaterresorts.com/wp-content/uploads/2018/08/LAW-PRESS-RELEASEaug10-PDF-IMAGES-1.pdf). In July 2018, the NVCA endorsed the findings of the EIS update. On the matter of parking, Larry is proposing 550 parking spaces that are clearly calculated and shown on his plans. This is contrary to the 350 number being reported. Nonetheless, the project must conform to zoning By-law parking requirements. Living Water Resort and Spa and its associated facilities have been part of a phased master plan that has been developed and refined over the past 14 years. The physical and financial planning that support this project respect the town's approved Official Plan and zoning By-law. The Official Plan is the town's long-term planning instrument and designates these lands as "Resort Commercial". Under this designation, these lands have a long term planned function within the community of providing a location for commercial development that serves resort residents, tourists and visitors. Likewise, the lands are zoned "Resort Commercial" and a wide range of uses are permitted some of which include convenience stores, conference centres, hotels and motels. The overall land use purpose and function for and of the land is clearly laid out in approved public rules and regulations. There is no proposal or intent to circumvent or ignore established rules and regulations. Such an approach serves no purpose to Larry who has been a long-term partner in the community and has long term plans to remain in the community. Larry is committed to abiding by town rules and regulations. Important decisions on growth, development and investments are made on the basis of these rules and regulations. Application of these rules and regulations must be based on truth and fairness. Truth and fairness require open dialogue based on facts. Larry takes pride in doing business as a mission, a mission to serve and help build a better place for the community at large through integrity, honesty, fairness, respect and care. But sadly, it is apparent that Truth & Fairness are suppressed to provoke public opposition without disclosing and understanding the full details of the matter. Can we have the trust to let the staff of all approving agencies to carry through the process based on the current rules and regulations? It is only fair for people to abide to the current rules and regulations. Larry and his team remain confident that in reviewing the proposed development plans, the Town Staff and Council will adhere to these basic principles.